Is Jeff Merkley a star on the rise for the Democratic Party? The junior U.S. Senator from Oregon generally had a low-profile during his first term in the chamber and was at one point considered vulnerable during his reelection bid during the GOP-friendly 2014 cycle. 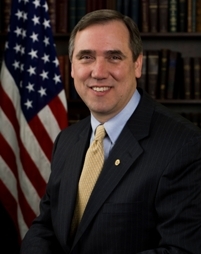 [Merkley ended up comfortably beating Republican nominee Monica Wehby by nearly 20 points]. During the 2016 presidential race, Merkley distinguished himself by being the lone U.S. Senator to endorse colleague Bernie Sanders in his campaign for the Democratic presidential nomination. Solidifying his progressive stripes, Senator Merkley is now garnering attention from the press about his own White House prospects in 2020. The country is now just two years out from the point at which most candidates will be officially in the 2020 sweepstakes, and if Merkley does suit up and launch a presidential bid he will be the first to do so from Oregon during the modern primary era. Since 1972, nearly 200 major party presidential candidacies have been launched, but none from Oregon – the 27th most populated state in the nation. The 2016 cycle saw a few Democrats from sparsely populated states enter the race with the first presidential candidacy in history by a Rhode Islander (Democrat Lincoln Chafee) and just the fifth ever by a candidate from Vermont (Sanders). The most recent Oregonian to run for president was Republican-turned-independent-turned-Democratic U.S. Senator Wayne Morse in 1960. Morse appeared on the primary ballot in the District of Columbia (losing to Hubert Humphrey), Maryland (losing to John Kennedy), and Oregon (losing to Kennedy). Morse did not receive any votes at the DNC that July in Los Angeles. The last Oregonian to have receive notable convention votes was long-serving Republican U.S. Senator Charles McNary in 1940. McNary, who emerged as Wendell Willkie’s vice-presidential running mate at the GOP convention, won his home state’s primary in May – but did not enter any other race. As a result, the four-term senator received 10 votes from his home state delegation on the first ballot but never achieved more than favorite son support at the convention. Prior to McNary, it had been almost 50 years since a candidate emerged from Oregon received attention at a major party convention. In 1896, former Governor Sylvester Pennoyer received eight favorite son votes from the Oregon delegation at the Democratic National Convention in Chicago that July. But perhaps the most famous Democrat from Oregon to launch a presidential bid was Senator Joseph Lane – who ended up as the vice-presidential running mate of Southern Democrat John Breckinridge during the infamous, divisive 1860 election. At the April 1860 convention in Charleston, South Carolina, Lane’s name was placed into nomination. The senator peaked at 20.5 votes during the 14th round of balloting – in fourth place behind his legislative colleagues Stephen Douglas of Illinois and Robert Hunter of Virginia and former U.S. Treasury Secretary James Guthrie. As a territorial delegate from Oregon eight years prior, Lane had also received votes at the DNC in Baltimore. Lane peaked that cycle at 14 votes on the 10th ballot – receiving 13 votes from Indiana’s delegation and one from Tennessee. Another Oregon U.S. Senator, Republican Frederick Steiwer was also mentioned as a candidate for his party’s presidential nomination in 1928 and 1936 (later giving the keynote address at the RNC), but he never ran in any primaries nor did he receive any votes at the national conventions. Previous: How Many Gubernatorial Seats Will the GOP Lose in 2018? 1 Comment on "Jeff Merkley and a History of Oregon Presidential Candidates"
1. “…sparsely populated states…” One of them happens to be The Razorback State, though she was neither born there nor a legal resident by the time she made her announcement in 2015 (Sanders himself is a native of Brooklyn, an “Outer Borough” with several times the population of his adopted VT). 2. Had the Willkie-McNary ticket won in 1940, the DEM speaker of the House would have ascended to the presidency in 10 of 1944; prior to the adoption of the 25th Amendment, POTUS could not fill a vacancy in the VEEP post. A close call indeed. 3. Senator Merkley presumably would have zero qualms about opposing “Her” (who seems totally unwilling to truly take any responsibility for her loss, or even quietly leave the political stage), but is he willing to compete against Senator Sanders in ’20?